US photographer Spencer Platt of Getty Images is the winner of this year's World Press Photo of the Year award. 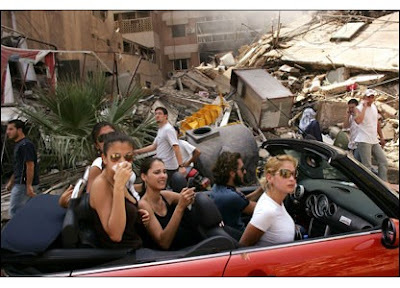 His picture, taken 15 August 2006, shows a group of young Lebanese driving through a South Beirut neighbourhood devastated by Israeli bombings. Jury chair Michele McNally of The New York Times says: "This photograph makes you look beyond the obvious." Click to support more good causes! Happy V day my friends!